an appeal, in 95% of cases in my opinion. Property that has prior flooding and is fully repaired is selling for a 10 to 15% discount, even considering everything is new. The discount would be larger if the age of carpet, cabinets, countertops, and paint was typical. 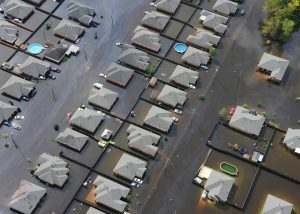 Flooded property not repaired is typically selling for a 50 to 60% discount, compared to flooded houses. If your house flooded and was not repaired on January 1, 2018, you probably qualify for a 60% property tax discount for 2018. The special late-appeal option available to flooded property owners is based on a substantial error. A “substantial error” is defined as if you are over-taxed by more than one-third, you qualify for a late appeal until January 31, 2019! This is based on 2525 (d) of the Texas Tax Code. Note that the appeal is a “substantial error appeal” and check the box for “other” for “Type of Appeal”. Repairs not completed as of January 1, 2018. A construction drawing from December 2017 or January 2018 would work great. If you do not have a construction draw, document repairs before and after January 1, 2018, as well as repaired not completed. Obtain the appraisal district’s hearing evidence package. This information is usually enough to get a reduction for you. You can download a step-by-step guide to getting the appraisal district’s evidence. Click here to get your guide! Review the appraisal district’s hearing evidence package. Look for error in their description of your property and comparable sales that support a reduction. If you own a flooded property, they most likely have an error in their description. Attend the hearing and you have a 2/3 chance to WIN! You are likely to get a meaningful reduction if you follow the above steps. If you do not want to handle your own appeal, click here to enroll in the Property Tax Protection Program. No-Cost program enrollment ensures that you are protected each and every year and you only pay a fee if O’Connor is able to reduce your property taxes. Hi Kim! Are you over 65?